Upright Grand: At the turn of the 20th century, countless American piano companies manufactured very tall upright pianos. These instruments offered the sound of a grand piano because of the long strings and large soundboard area. They coined the term upright grand to describe these typesof instruments. We sampleda Schubert Upright which has over 2.1 meters in height, Made in 1905 with good condition. Modern Era:A Yamaha U5 made in 2015 with excellent condition, U5 is the most common seen, best sounding and the largest mass production brand upright nowadays. For it huge sound and big sound, it can be compare with a Baby Grand thusit can be also categorizedas an upright grand in the standard around 1900. Bech 1929:A bechstein upright made in 1929. It has a unique style of sound. It sounds more gentle than usual upright pianos and this especially good for soft, new-age or Jazz music.This is a special one that you won’t want to miss. Honky Tonk:A bar pianos specialized in Honky Tonk style. We provide it so musicians can enlarge theircollection to fit different stylesof music. Antique Upright:This vintage upright piano was manufactured in 1903, and has a breath-taking sound that’s entirely its own -making it completely unique from other uprights. Musically, then, through using hybrid modelling technology, The Best Computer Music And Acoustic Technology Inc has succeeded in creating a uniqueexperience —exploited to the full with Upright Grand—that allows its users to reap the benefits of authentic sampled sounds combined withthe playability of a modelled piano, providing for more freedom of expression and potential possibilities to create their own unique sound. Centralto this, that new Neo Pianoengine elevates proceedings, purportedly by being the industry’s first large-scale application of AI (artificial intelligence)in its software developing phase. Put it this way: while it is common knowledge that recording, editing, processing, and organizingsuch hugesample data pools can collectively take teams of expert engineers years to complete, conversely AI can conceivably reduce this titanic task to amatter of hours, meaning musicians get their hands on better products much more quickly while also benefitting from financially reduced rates. Duly delivering yet another breakthrough, the new Neo Pianoengine powering Upright Grandgenerates Multi-Dimensional Resonance. Reality dictatesthat every piano’s sizeable soundboard reflects sound that resonates in conjunction with the wooden body of the instrument itself. Indeed, it isthis continuous process that makes every note played sound so unique. Ultimately, in order to simulate this behavior, The Best Computer Music AndAcoustic Technology Inc.captured multi-angled IRs (Impulse Responses) from the soundboard, then used modelling technology to convert those IRsinto Multi-Dimensional Resonance algorithms. The result? An amazingly true to life concert hall sound readily available at anyone’s fingertips! 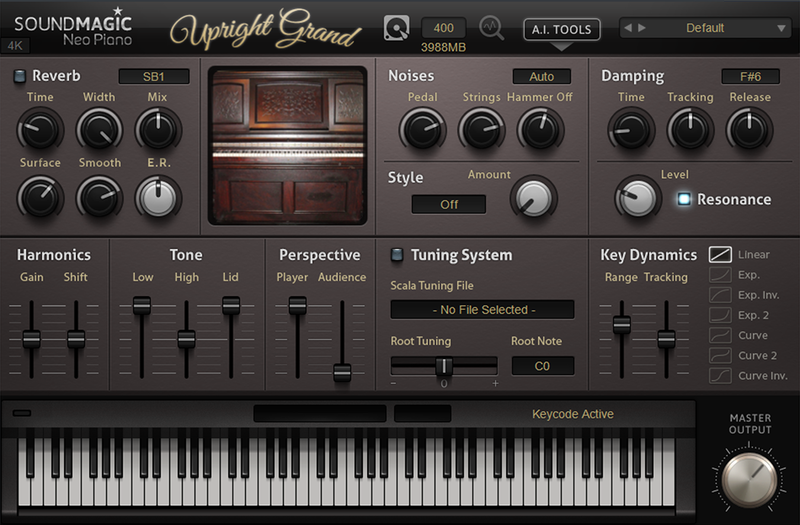 Furthermore, that beautifully-implemented Upright GrandGUI gives users unmitigated control over 40 piano attributes, including an ability to lift the lid,tweak Tone and Harmonics, alter Damping, change Key Dynamics, and adjust velocity response. Ultimately, users can even apply a style —setsthe piano in question’s musical style, be it classical, jazz, rock, or soft, and changes the internal parametric EQ accordingly via a simple amountcontrol —or sympathetic resonance to their sound, and adjust the mix by changing microphone perspective.